Have a look at a local charity that we support, they are the National Coastwatch Institution and, contrary to popular belief, they are not funded by the Coastguard but are a self funding charity. 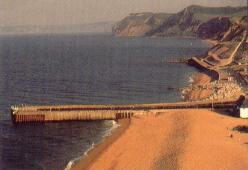 The famous West Bay piers which gives the harbour protection and access to the sea. Fishing boats will take you on trips from the harbour. Old cottages and a slate hung early 19th century customs house fringe the beach. Nearby are characteristic kiosks, pubs and restaurants. 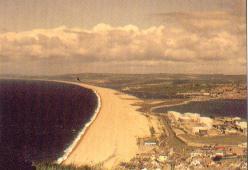 The famous Chesil bank from Portland Bill with West Bay in the distance. There are two good bathing beaches, one shingle and one pebble at West Bay. 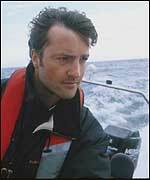 You will experience the sets at which the TV series 'Harbour Lights' (1999 - 2000) was filmed starring Nick Berry.